He had been House Surgeon of the New York Hospital 1850-51. Appointed Brigade Surgeon, US Volunteers, on 3 August 1861. By February 1862 he was Division Surgeon and acting Medical Director, Department of North Carolina, on the Expedition under Brigadier General Burnside. 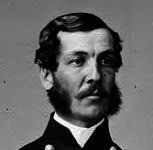 His photograph from a full-length portrait in the collection of the Library of Congress1. His appointment as Brigade Surgeon published in US Army General Orders No. 62 of 20 August 1861. Life details from his death notice in the collection of the New York Society Library: At Pau, France, on Thursday, Sept. 27, in the 41st year of his age, William Henry Church, M.D., of this City, formerly Division Surgeon on Gen. Burnside's Staff, and youngest son of the late Hon. Philip Church, of Belvidere, N.Y.